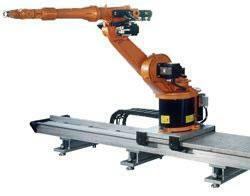 Jet Edge's EDGE X-5 5-Axis water jet cutting system cuts taper-free and beveled parts from virtually any material. Heriot-Watt University and the University of Edinburgh have jointly secured 6 million of UK government funding for research into robotics and autonomous systems. The Congressional Robotics Caucus was formed in 2007 to focus on key issues facing the nation's robotics industry and related emerging technologies. Microscan, a global technology leader in barcode, machine vision and lighting solutions, announces new Microscan Link connectivity, providing vision engineers, programmers, and other users with additional options for communicating with Microscan smart cameras. Four student teams from Embry-Riddle Aeronautical University's Daytona Beach, Fla., and Prescott, Ariz., campuses designed and flew aircraft against 35 teams from U.S. and international universities at the Student Unmanned Air Systems competition. Soft Robotics (SoRo), a new peer-reviewed journal dedicated to the science and engineering of soft materials in mobile machines. These systems are designed to minimize accidents by addressing the main causes of collisions: driver error, distractions and drowsiness. Three key technologies, identified in the pre-budget statement by The Chancellor of the Exchequer as part of the government's 'eight great technologies' to drive UK growth, are to receive an 85 million investment for capital equipment.